During the Easter holidays 4 members of our Under 12 Yellows squad travelled to Hurworth to play in a trial game for Middlesbrough’s Academy. 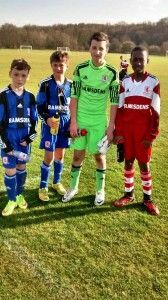 The game was made up of the current Middlesbrough U12 squaqd and a select group of trialists.All of the boys represented the club very well and did themselves proud in the game proving that they are more than comfortable playing at an elevated level. Michael Roxburgh, Jonathan Krakue, Elliot Floyd and Bailey Chapman have all been with the club for many years now and were part of last season’s ‘invincibles’ squad that won the second division championship without being beaten and also won the keenly contested Filey Cup. They have found the first division a little tougher this year however and after winning the first three games of the season the team struggled in the run up to Christmas in what is a very tough division. The boys have now adapted to the increase in quality and have rallied to currently sit a respectable 5th. Goalkeeper Roxburgh is currently in his 5th season with the club having joined as a 7 year old. Michael is a tremendous shot stopper who is technically sound with great hands and terrific distribution. Having worked hard at improving his presence and communication this season Michael is now seeing the rewards and is also currently on trial at Newcastle United. Jonathan, who came through the clubs Saturday morning club, is a strong, athletic centre half who can also play a bit as was seen recently in a game at Whinney Banks when with the team a goal down he smashed a 30 yard screamer in to begin a comeback that turned into a 3-1 victory against a very strong side. Jonathan spent the end of last season training with Middlesbrough’s Academy and has this season improved technically and is a great organiser. Elliot Floyd is another player who came from the Saturday morning club and anyone who has had the misfortune of spending any time with the teams management will be aware of how highly rated Elliot is. Elliot has spent the last two seasons with Middlesbrough’s development centre and is an all round player with exceptional balance and an eye for goal. Elliot has been unfortunate with injuries this season forcing him to miss a few matches. Bailey Chapman is now in his 3rd year with the club and continues to get better and better. Bailey can play in any of the forward areas and scored in the trial game past his team-mate Michael. Bailey has this season found himself spending more time playing in a deeper midfield role but typically unselfishly he has thrived and matured into a key team player. Bailey spent last season training with the Academy and has a touch of class. He however hasn’t developed a step-over to match that of his fathers, the first teams Andy Westwood, but when he does he will be unstoppable. We would like to congratulate all of the boys and hope that they are the next ones off the clubs prolific and seemingly never ending conveyor belt of talent.